Oh my stars, it didn’t take me months to do another review this time! 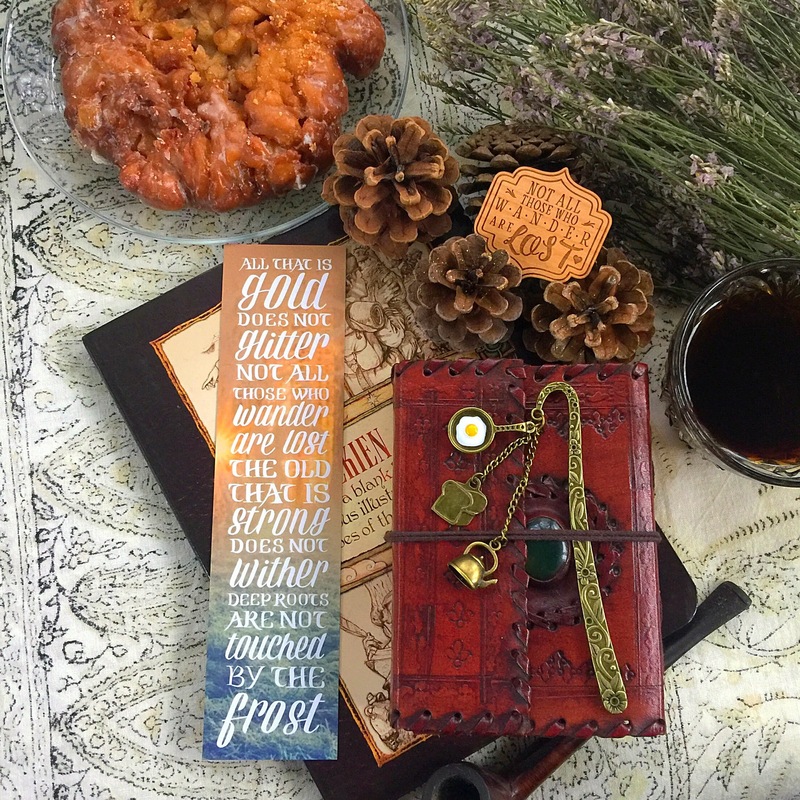 I was super stoked about this because this was my first time subscribing to Nerdy Post, and that’s because the April theme was Middle Earth. 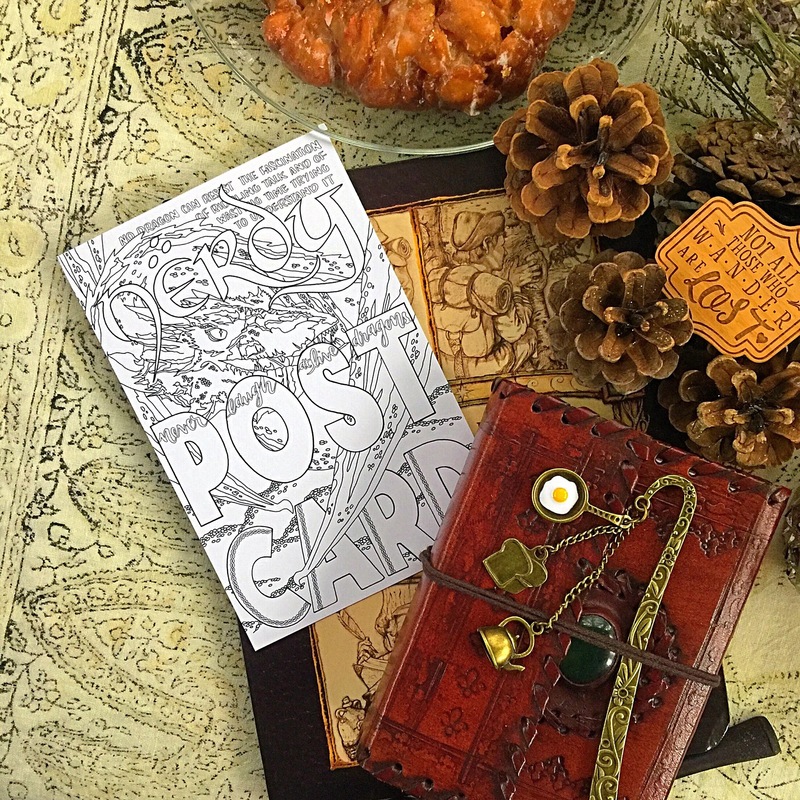 Nerdy Post is a fandom subscription box created by Alexis Lampley. Most of the product designs are made by her! 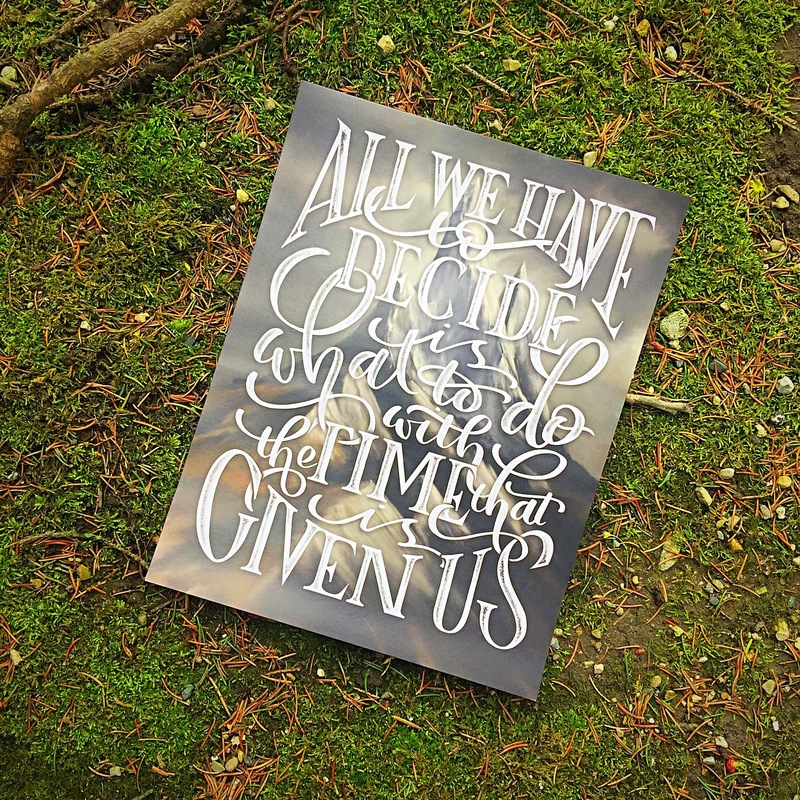 She’s got quite the talent for script lettering and calligraphy. On a side note, not sure if I mentioned how I was a total Tolkien trash, so there was no way I wasn’t going for this precious box! Without further ado, let’s begin! Right off the bat, I got to see this super cute mini print by TJ Lubrano! I loved the whimsicalness of it with Frodo looking happy to leave the Shire for a journey, accompanied with a Gandalf quote! Behind this print was a list of what was included in the box, so I skipped all that so I could surprise myself. 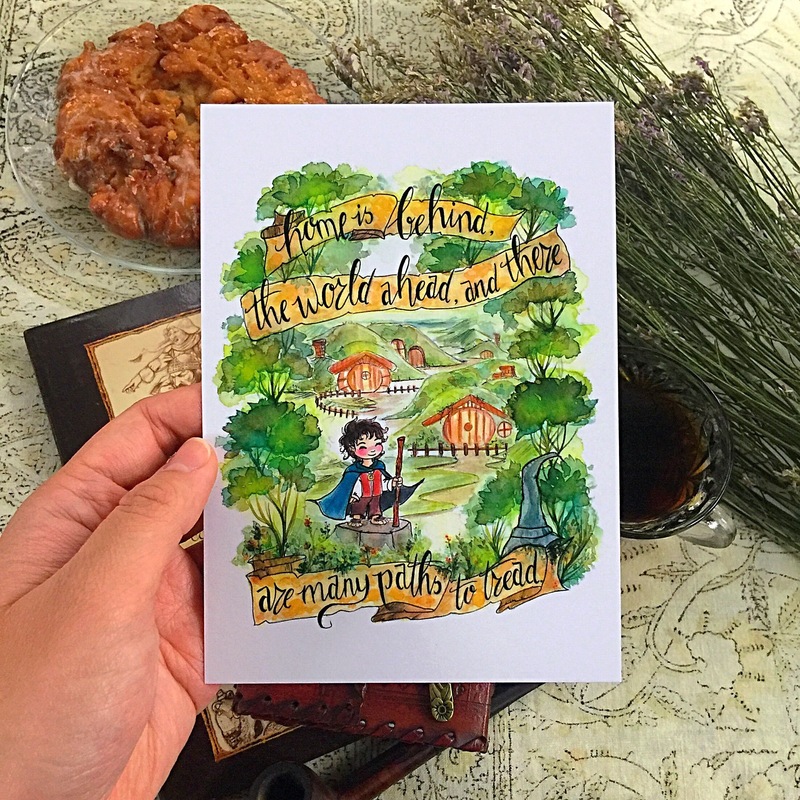 The first bookmark had an Ent illustration with a Tom Bombadil quote. Quite appropriate to pair the two together as Ents were known to like taking the longer way of things! Also, I want to add on that the quality of the paper used for these were not flimsy at all! Be rest assured that the material was sturdy and the texture was pretty nice! On the flip side of the same bookmark was another beloved and iconic quote. 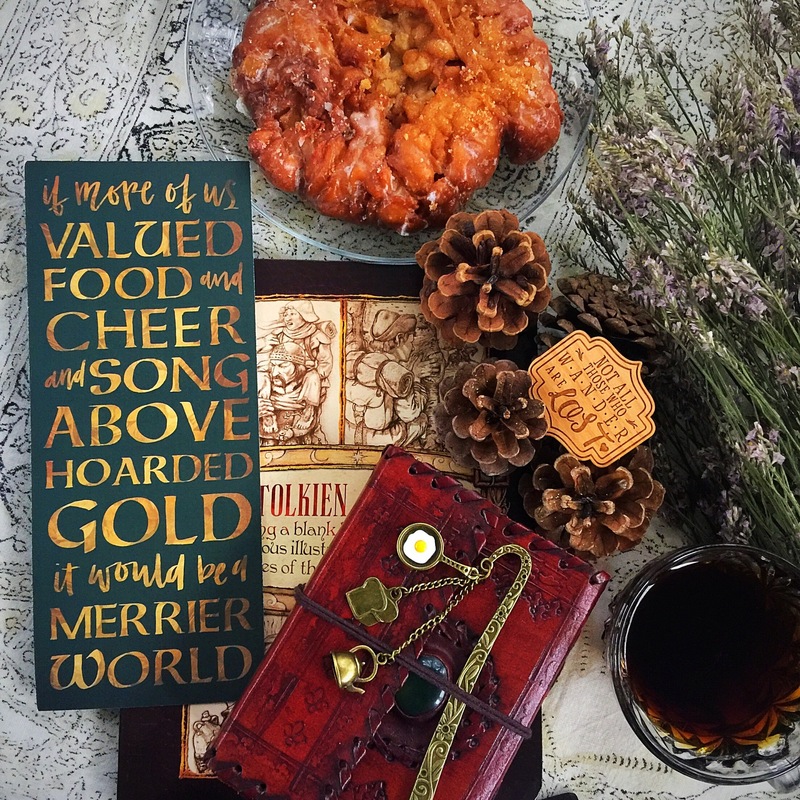 It’s awesome that Alexis included more than just the first line for this because those who are not Tolkienites usually got a negative connotation on “all that is gold does not glitter” when the rest of the verse actually had a more hopeful meaning behind it. 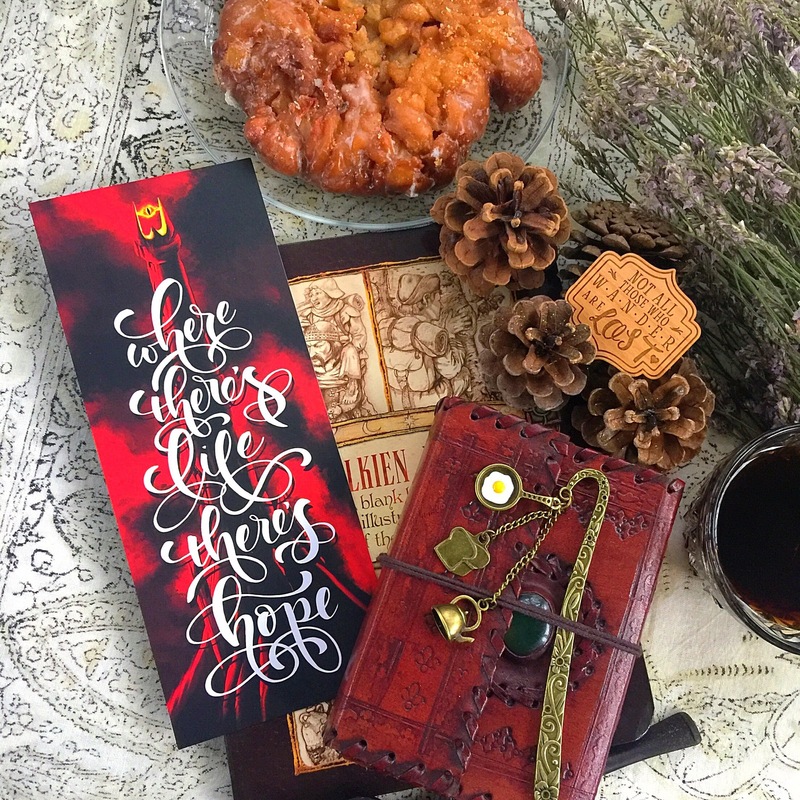 I want to reiterate again that all the calligraphy are done by Alexis, and I was super impressed how this bookmark turned out! 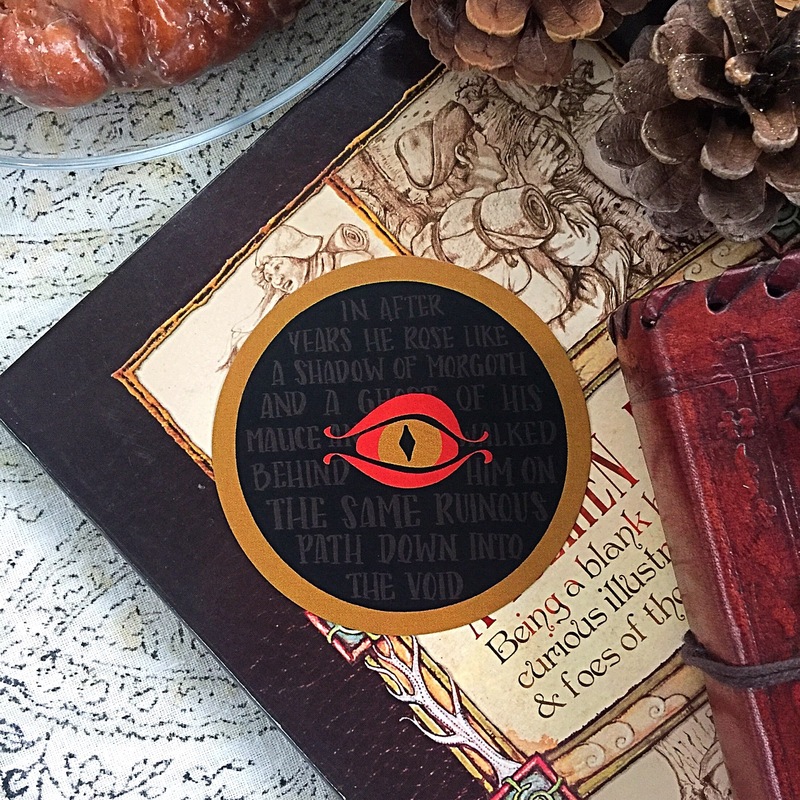 Next up was a sticker depiction of the Eye of Sauron! This quote about the dark lord was taken from ‘The Silmarillion’, my fav Tolkien book! It’s great that Alexis included a villainous aspect to the box. Sauron’s one of my fav bad guys, afterall! 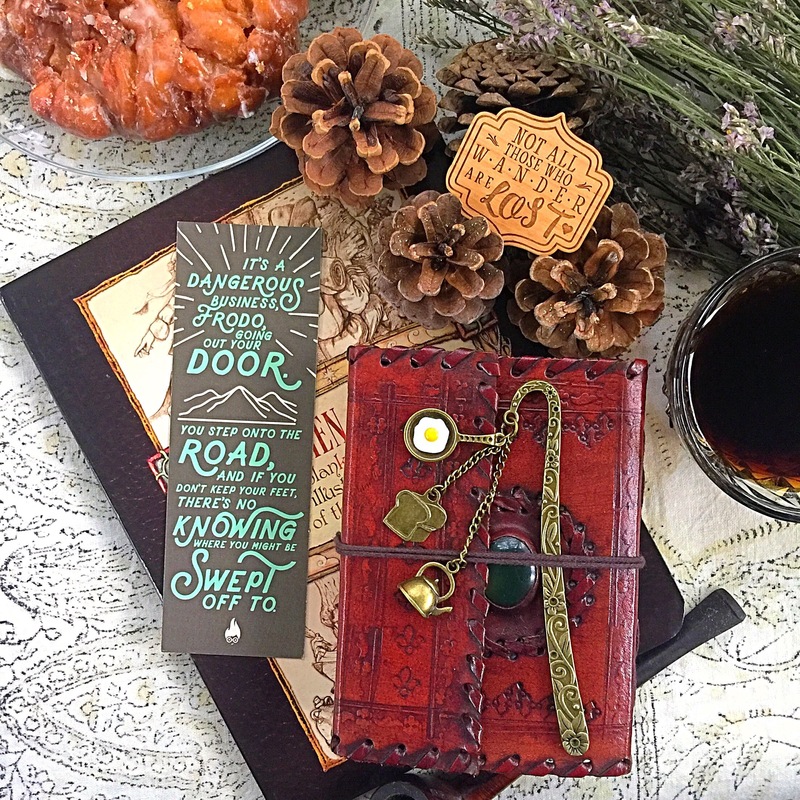 The next bookmark had a greater width than the first bookmark, and I fell in love with it immediately! We got this ominous, fantastic illustration of the Great Eye in Barad-dûr contrasting with the more positive quote from Bilbo and Sam Gamgee! This was said by Sam when he was journeying to Mordor with his friend, Frodo Baggins. It certainly made me remember how solid their broship was, moreso on Sam’s part! The insight behind a positive quote being needed in a time of darkness was inspired! Behind the same bookmark was a quote from Thorin Oakenshield imparted to his friend Bilbo. This quote was always the feels for me, especially after watching Battle of the Five Armies. I liked how she kept the design simple…the message was strong enough to stand by itself without further decorations. This was a somber but valuable quote about Bilbo’s character in the eyes of the King Under the Mountain. Hobbits really were outstanding creatures full of light and innocence. No wonder they’re Gandalf’s fav race! This extra bookmark was actually a coupon for Nerd Wicks Candles, but I was surprised that behind that was another Gandalf quote! It’s nice that even with advertisement materials, they kept to the theme. I was squealing when I first saw this. Def one of my favorite items in the box! I ADORE WASHI TAPES! I utilized them a lot when I’m designing snail mails or postcards for exchanges with friends all around the world! 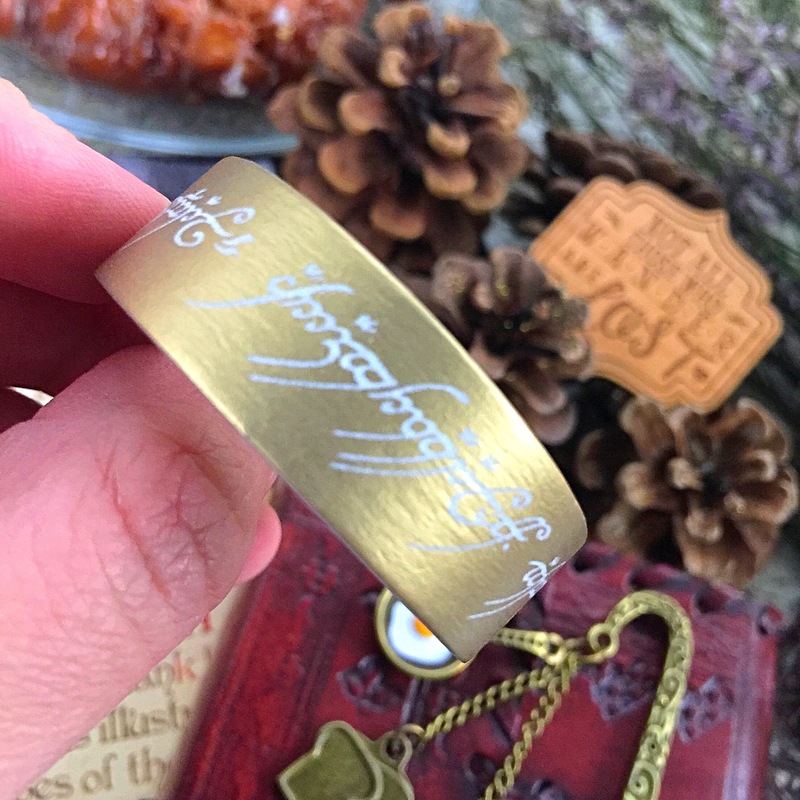 The design on the tape was the elven script of the One Ring! One tape to rule them all, indeed! I don’t think I’d have the heart to use this, though…I’d probably hoard this precious washi tape all to myself! 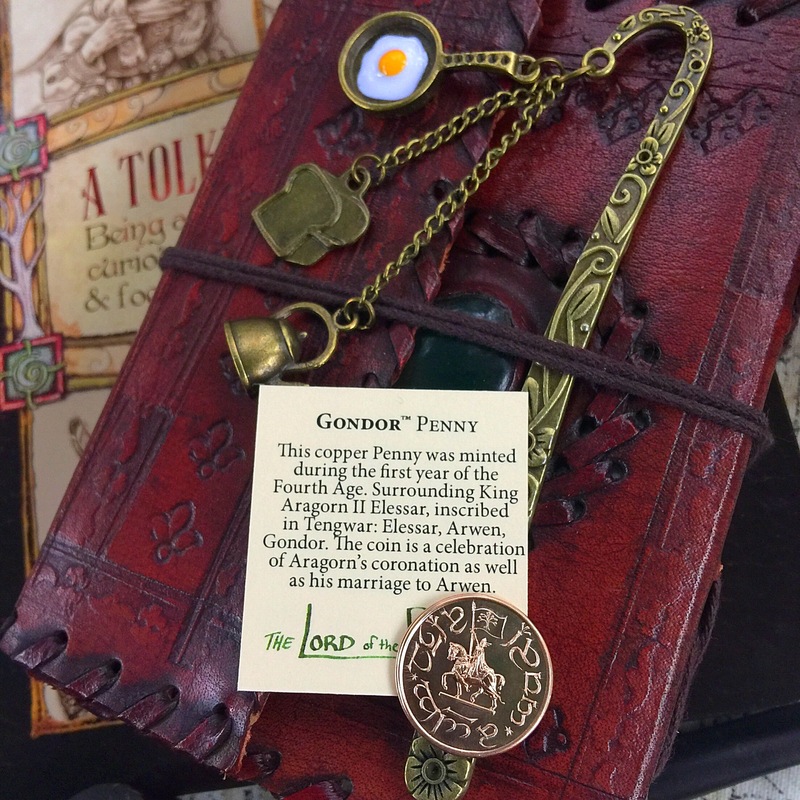 This Gondor penny was my second favorite item! This was exclusively made just for this box by Shire Post Mint! The foreign vibe on this was strong and I was always happy to add more goodies to my Tolkien collection! Every Nerdy Post box always had one of these postcards that you could color in! In this one, I got a ferocious looking Smaug illustration; very cool! Overall, I gave this box a 5/5! Opening everything was a trip of nostalgia for me, and I would definitely use these for my bookstagram photos! 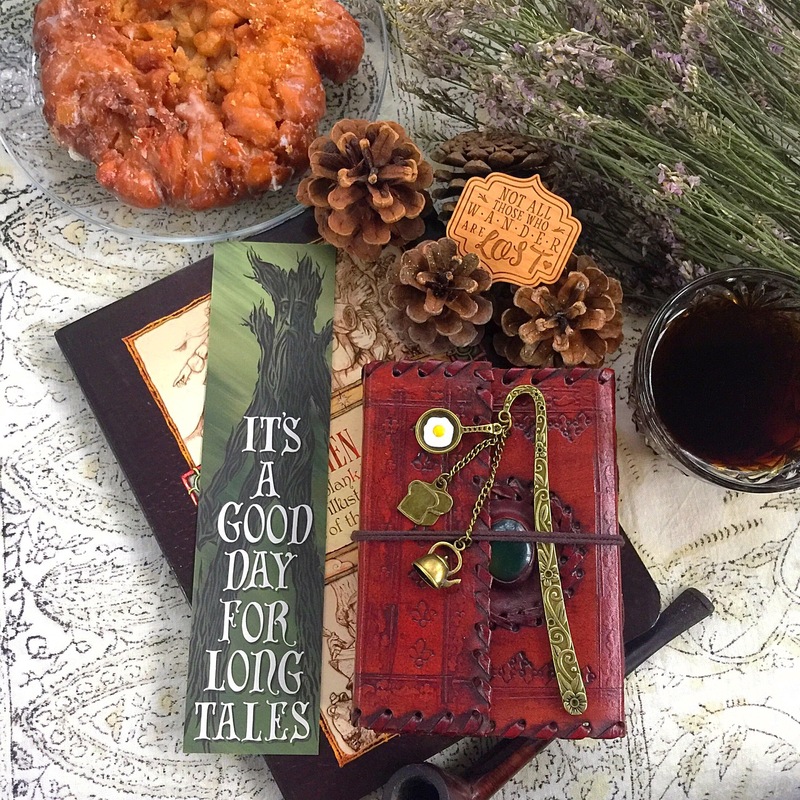 Also, if you’re wondering, the Second Breakfast bookmark and wooden pin were not included in the box, but you could get them for yourself here at Riddle’s Tea Shoppe! The May Box will be Sarah J. Maas themed in celebration of the ACOWAR release. Unfortunately, the cut off to subscribe for this box had passed. You could still get in all the fun for the June Box, though! It’ll be Nerdy Post’s one year anniversary box with a general fandom theme, I believe! You have until the end of May to subscribe, so don’t wait if you liked the goodies I got! This might be the best box I’ve ever seen <3! Everything looks awesome and I can tell that they put it together with love :D.